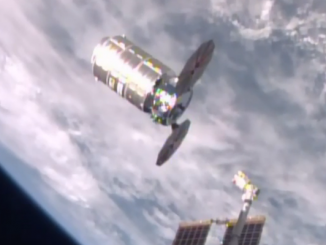 EDITOR’S NOTE: Updated at 3:30 p.m. EDT (1930 GMT) after end of spacewalk. 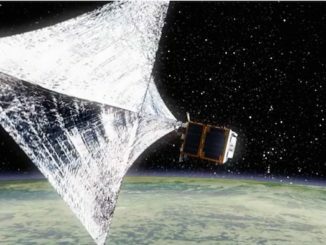 Their task was to finish a job already started by flight controllers remotely operating the station’s robot arm: replacing six massive nickel-hydrogen batteries on the port, or left, side of the station’s power truss with three more powerful 300-pound lithium-ion batteries. McClain and Hague had to install three 75-pound adapter plates and cables needed to tie the new batteries into the station’s electrical grid. The plates also provided mounting points allowing two of the older batteries to be stored there indefinitely. The rest will be mounted on a pallet for disposal aboard a future cargo ship. 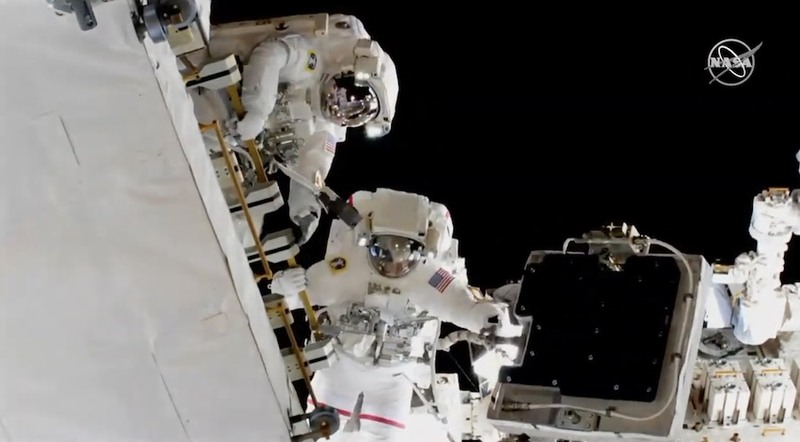 If all goes well, McClain and newly arrived crewmate Christina Koch will carry out the second battery replacement EVA next Friday, installing another set of three lithium-ion batteries and adapter plates on the port inboard truss. In so doing, they will chalk up the first all-female space outing since cosmonaut Alexey Leonov carried out history’s first spacewalk in 1965. 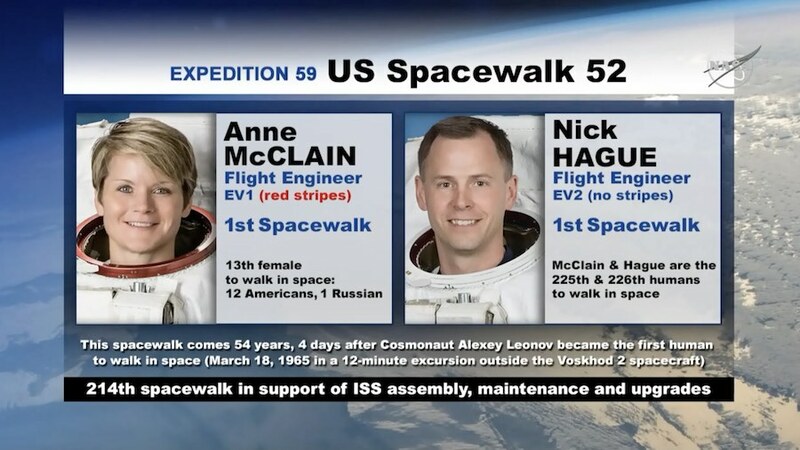 McClain and Koch will become the 13th and 14th women to walk in space since cosmonaut Svetlana Savitskaya became the first in 1984. NASA astronaut Kathryn Sullivan became the first U.S. female spacewalker later that same year. The assignment of McClain and Koch is partly the result of chance — the batteries originally were to be installed last fall but the work was delayed by a variety of issues — and a desire by NASA management to give more of the agency’s astronauts spacewalk experience. “We go through a sunrise-sunset about every 90 minutes on station, so we don’t have the benefit of having the sun all the time,” said Mary Lawrence, the spacewalk flight director for the upcoming EVAs. “So we need a place to kind of store energy. The station’s eight electrical power channels originally were supported by 48 nickel-hydrogen — NiH2 — batteries, six per channel. Twenty-four batteries, in two sets of 12, were mounted at the bases of the two solar array wings on the starboard, or right, side of the station’s main truss with two sets of 12 on the port side. 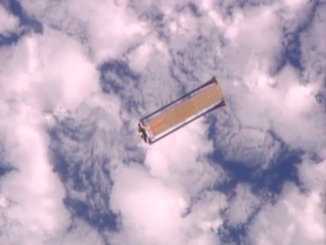 NASA is in the process of replacing all 48 of the old nickel-hydrogen batteries with 24 smaller, more efficient lithium-ion — Li-Ion — batteries carried up to the station aboard Japanese HTV cargo ships. “It’s an ongoing maintenance operation, it’s one we put in place several years with the purchase of the lithium-ion batteries, stepping up the technology,” Todd said. “Just like your rechargeable batteries at home, eventually over time they’re not going to recharge as well, they’re not going to hold as much charge when it comes to putting loads on them. The 12 nickel-hydrogen batteries on the inboard starboard 4, or S4, truss segment powering electrical channels 1A and 3A were replaced by six lithium-ion batteries during spacewalks in January 2017. Friday’s spacewalk and the EVA next week are devoted to installing another six, three at a time, on the inboard port 4, or P4, truss segment for the 2A and 4A power channels. The outboard batteries will be installed during future spacewalks. Replacing the batteries is a complex shell game of sorts. At the start of the first spacewalk, power channel 4A had already been isolated from the station’s electrical grid and the six older nickel-hydrogen batteries powering that channel were drained. Flight controllers remotely operating the station’s robot arm had already removed four of the older nickel-hydrogen batteries and installed three of the new lithium-ion batteries in slots one, three and five. Two older NiH2 batteries were still in place in slots two and four while the slot six was empty. With the three power channel 4A lithium-ion batteries already in place, McClain and Hague had to install three adapter plates in slots two, four and six to tie the new batteries into the station’s solar array power system and to provide storage locations for the two older batteries that were still in place when the spacewalk began. With that work done, flight controllers were clear to bring power channel 4A back into the station’s electrical grid. McClain and Koch will tackle the power channel 2A battery swap outs next Friday.